This large display case selection is perfect for retailers looking for a more upscale, classy means to display products. The "against-the-wall" style of many of these towers also helps retailers with minimal floor space. 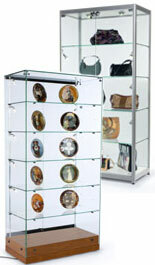 This large display case is perfect for cramped or crowded retail locations. These glass showcases are ideal for home use as well. 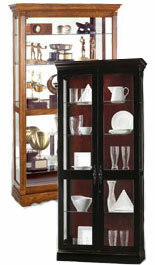 One of these corner large display cases would complement dining room decor, and exhibit your collectibles beautifully. Curio cabinets not only showcase valuables, they also keep them protected from curious children. Most of the large display case fixtures available here come with locks to prevent any unwanted access. 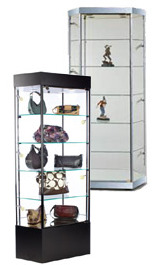 Use these glass showcases in a retail setting to control access to precious objects. If this large display case is a little too big for your needs, there are coordinating units within each series that will certainly work for you. Most of these glass units come in multiple wood finishes, including but not limited to; black, silver, cherry, oak, maple and rosewood. Start shopping for a large display case here, and see all that there is to offer! 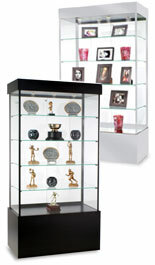 In addition to these large display cases for home use, there is also a huge selection of commercial showcases. These store fixtures are often seen in schools, universities, as well as business lobbies. Corporate offices like to use these large display cases to exhibit awards, and accomplishments for all their visitors to see. Retail businesses utilize these fixtures to display their objects for sale. Most of these large display cases offered here come with removable and adjustable shelving, to allow for items of varying heights. These different product lines have been labeled with different numbers so that shoppers can be assured that the different fixtures selected are from the same product "family". Buy these large display cases along with coordinating smaller units within the same series for a clean, uniform look. Many of these glass showcases come with hidden casters for ease of moving the unit around. These large display cases have wheels underneath the base, so that the look of the unit is not cheapened by having the casters visible. Choose one of these wooden showcases for your office or business lobby today! This large display cabinet is also suitable for residential use. There are many Howard Miller curio showcases, ideal for displaying trophies or other collectibles at home. Many of these showcases can even be used as display cases for action figures. No matter what large display cabinet you choose, you can feel confident you are ordering a high quality item, sure to last decades. These showcases are available in many sizes, shapes, and colors. Shoppers are sure to find a large display cabinet that will far exceed their expectations. Most of these glass showcases feature fully adjustable glass shelving to allow for versatility in the height of merchandise placed in the cases. Many of the large display cabinet merchandise also feature floor levelers. These "feet" adjust to compensate for uneven flooring or carpeting that tends to make a showcase less stable. This large display cabinet selection also includes units with mirrored decks. In conjunction with the overhead lighting; the bottom shelf reflects the light to create an alluring exhibit area. Which large display cabinet comes with standard over head lighting? The vast majority of these glass showcases come with standard canopy lighting. Some of the large display cabinet fixtures shown here also come with optional side lighting to further spotlight the merchandise on display. The size of the showcase typically determines the number of lights housed in the canopy. Are there large display cabinets for sale here that are able to ship same day? There is a wide range of wooden showcases that qualify for same day shipping options. These large display cabinets must be ordered prior to 3PM EST to allow our inspectors adequate time to do all final quality checks prior to loading the unit on the truck for shipping. For a complete list of all of the oversized showcases that are able to ship same day please see the product details pages, or contact a member of our staff. Along with these large display cabinets seen here, there is a wide variety of POS displays that can be seen in these online catalog pages. View all of the other options beyond retail merchandising display including; retail store counters, wall display cases, poster frames and custom display fixtures. This corporation has been designing and offering quality display products for more than three decades. What started as a one man business, is now home to over a hundred and fifty employees, and occupies three huge facilities. There are nearly two million units in these warehouses at any given time. By maintaining this huge inventory; lead times are kept to a minimum, as are prices. Much of the pricing shown here is way below any of competitors'. Be sure to browse through the selection of clearance merchandise in the sale section. The merchandise featured on these pages are; over-stocked, discontinued or scratch-and-dent products that have been markedly reduced and priced to sell. Also, check out all of the new merchandise that are added to this site on a daily basis. Be sure to bookmark this site as a preferred and check back frequently for all of the latest additions to the different product categories.